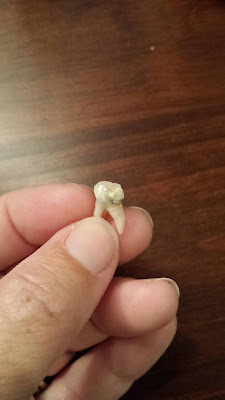 We had been struggling with one of Jordan's teeth, it had abscessed twice. We had been diligent in visiting dentist to make sure the families teeth were healthy however, it seemed that every dentist we went to missed something. When we left Turkey in April 2016 we visited a dentist and we all had work done with the exception of Jordan. Before we crossed the Atlantic we visited a dentist in Palma de Mallorca. The dentist asked me if Jordan had ever been to a dentist because she had 5 cavities. We had 3 of them "fixed" and during this ordeal she had a panic attack. One of the cavities was super deep and some how during the process the tooth was damaged and became abscessed. Each time we visited a dentist Jordan's fear escalated and each dentist would not listen to her concerns while fixing problems. Our last visit in Martinique broke the camels back so to say and the following day her and I were on our way home to have sedation dentistry done at Just4Kids (http://www.j4kdentistry.com). I had my concerns about using drugs for the treatment but can tell you, it was the best decision for Jordan. She was calm, sleepy and was able to have all the work done in a safe environment. I am hoping that her experiences at Just4Kids have undone some of the trauma that she had experienced previously. If you are traveling like we do be careful of the work being done. For whatever reason the work done in other countries does not compare with the work we have had done in Canada.